It’s only when you feel safe that you can concentrate on the job and perform at your best. An obvious truth, but one that particularly needs to be heeded in construction, where the accident rate is twice as high as in other sectors. 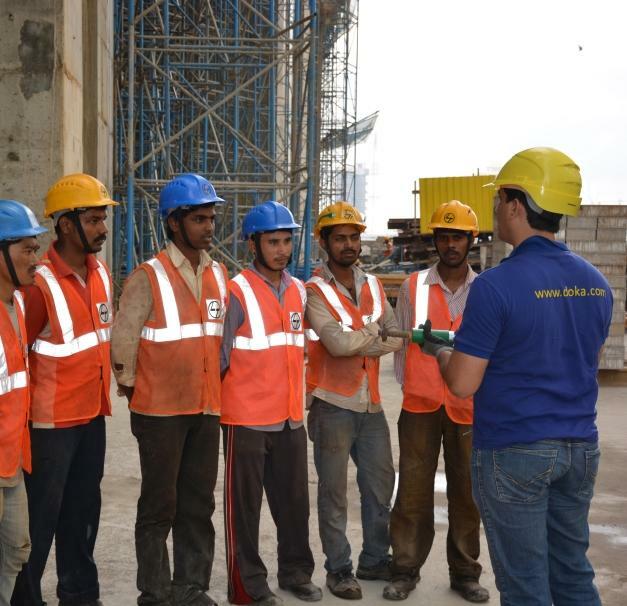 So, taking a leading role, Doka organized safety trainings at the ongoing high-rise construction sites. At Doka, solutions featuring all-round safety are an integral part of the company’s culture, making The Formwork Experts top-caliber people to work with on all safety issues. Study after study has shown that on safe jobsites, people work faster. Quite apart from human suffering and loss of value-creation, accidents also cause heavy costs ranging from sick-leave to legal consequences which may even include work on the site being stopped altogether. This is why Doka has long given top priority to making its formwork systems safe and easy to use and moreover has started a campaign where all agencies involved (i.e. Formwork gang, steel fitter, foremen, etc.) are briefed on safe usage of anchor systems of Doka climbing technology and have put-up posters giving details on the same. Thank you for your interest - Working safe with Doka. Thank you very much for your interest - Working safe with Doka.